For a long time, Southern rock was definitely out of favour with no Southern Rock bands making it big, and the genre as a whole having a very low profile. Happily though in the last few years bands such as Black Stone Cherry have brought Southern Rock out of the wilderness and as a result we're seeing some great bands releasing albums. 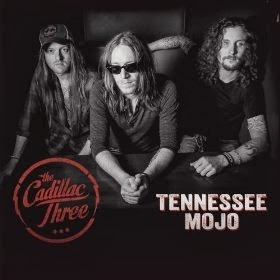 The Cadillac Three were initially called "American Bang" and in 2010 released ther debut album which was produced by Bob Rock, but soon found themselves at odds with their label. Since then they've changed their label, lost a member, changing from a 4-piece to a 3-piece, and gone back to making music how they want it. They've got a songwriting track record with singer/guitarist Jaren Johnston hainvg written the number one hit single "You Gonna Fly” for Keith Urban. The band have also shared stages with the likes of ZZ Top and Lynyrd Skynyrd. It's always nice when you get an album by a band you've never listened to before and have no expectations of, and press play and find yourself absolutely loving what you hear. That's what happened with this release - I hit play, listened to the album, then hit play and listened to it again (several times in fact). This is great Southern Rock - great catchy tunes with a real feel-good factor. There's no complicated lyrical theme or concept to the album - it's just straightforward rock songs about having a good time, and sometimes that's just what you want. Definitely an album I'd happily recommend. 'Tennessee Mojo' is out now on Spinefarm records.